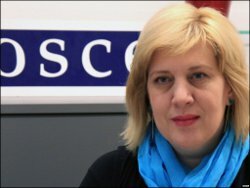 The Representative of the Organization for Security and Cooperation in Europe on Freedom of the Media, Dunja Mijatović, recently praised the Kyrgyz authorities for “creating a favorable media environment.” However, she fell short of specifying what exact “favorable environment” she meant in a country, which lived through the horrors of two “revolutions” and the blood chilling interethnic carnage. But what “example” is the highly esteemed guest is talking about? What do such elevated praises testify to—the speaker’s incompetence in said matters or de-jour hypocrisy? Also, Ms. Mijatović claims, “In recent years, there have been no violent attacks on journalists.” The last and the only one she did mention was the assassination of Alisher Saipov. I, for one, am surprised she is seemingly completely unaware of what happened in Kyrgyzstan between 2007 and 2010 and since? Oh, she is aware! In 2010, Ms. Mijatović has justifiably and harshly criticized (albeit not publicly) the Kyrgyz authorities for what happened to Uzbek-language mass media in the country’s south. I wonder what has changed since then? Has justice establish its reign in Osh and Jalalabad and the rights of two Uzbek-language TV channels were restored after they were accused of separatism and inciting disorders, then being forced to flee their motherland and being convicted in absentia for long terms? You know, forget about the two directors for apparently they will never be able to enjoy justice. The personal fates of these prominent journalists could perhaps be overlooked if the broadcasting of ransacked Uzbek-language TV stations and printing of Uzbek-language newspapers were restored, even if without their participation. I could be—and most probably will be—yet again accused of repeatedly “drawing attention” to the so-called “Uzbek issue.” Every single time our website carries information on the rights of ethnic minority Uzbeks, the Fergana editorial office braces itself in the face of harsh threats from commentators, who do not bother to conceal their nationalistic attitudes. Unfortunately, none of these mentioned “activists” is not intended to seriously and responsibly discuss this extremely sensitive topic; instead they prefer to brutally shut the opponent’s mouth. Certain international officials, who are actually tasked to defend the Central Asia residents’ rights, also prefer to ignore the “Uzbek issue”: “I see nothing, hear nothing and say nothing.” Why is esteemed Dunja Mijatović praising the Kyrgyz government and not demanding the release of Azimjan Askarov? Has not this ethnic Uzbek been convicted for that very journalism (and human rights advocacy) she is supposed to defend?! That said, he was not convicted for filming the unfolding events during the tragedy of June 2010 alone. The major reason for his conviction was his activities in the years prior to the “crime against humanity” in 2010—during the “dictator” Akayev and Bakiyev administrations’ in office. He has turned into a serious concern for power-wielders in Kyrgyzstan for he did not fear to publicize their horrendous atrocities in 2005-2006. It is, therefore, noteworthy that he was not imprisoned back then, but after the “revolutionaries” so much praised by the OSCE’s envoy for mass media took office by force in April 2010.